We will take you out on a guided tour in Mashhad and our Saffron fields located in Torbat-e Heydarieh. This city is famous for its Zafaran lands. It has the first rank in the world for producing Saffron or Zafaran in Persian. We share our learning and appreciation of farming and rural lifestyle through tasting of Saffron products. Today we take you Mehrabad International Airport to fly to Mashhad where you’ll be escorted to the Hotel. Tonight you are free to explore Mashhad and its famous Mashhad bazaar for yourself. This morning we visit the mausoleum to the eighth Imam of Shia Islam. The Imam Reza shrine in Mashhad, Iran is a complex which contains the mausoleum of Imam Reza, the eighth Imam of Twelver Shiites. It is the largest mosque in the world by dimension and the second largest by capacity. Today we drive from Mashhad to to Torbat-e Heydariyeh to visit Saffron farms and taste some of the main products contains Saffron like tea, Cakes, Rock candy etc. We’ll start our day in the Saffron farms. Be captivated by a visit to a saffron garden during which tour lecturer exposes you the culture of this beautiful flower, Crocus sativus and how you can get saffron from it. Our friendly hosts look forward to sharing their wealth of knowledge and stories of the Saffron in Iran as they guide you through a tasting Saffron tea. We take care to make your experience as enjoyable, informative and interactive as possible. Here you can buy high quality saffron directly from farm owner. In the afternoon we go back to Mashhad. This morning, we take you to the airport for your included flight to Shiraz. Today, you will visit Nasir-al-Mulk Mosque (Pink Mosque) few steps far from Vakil Bazaar. It built by the order from one of the lords of the Qajar Dynasty, Mirza Hasan ‘Ali Nasir-al-Mulk, it took 12 years to complete in 1888. Its interior reveals a magnificent masterpiece of design with stunning colors. This is a space where light and worship intertwine. The mosque comes to life with the sunrise and colors dance throughout the day like whirling dervishes. It reflects on the ground, walls, the arches and the towering spires. It even reflects on the visitors as if a colorful ball is hit by the first sun ray and explodes to thousands of butterflies all around. Then you will visit Karim Khan Citadel Built during the Zand Dynasty. Explore Arge Karim Khan, a museum that once served as a fortress and prison. Built in the 12th century under the Zand dynasty, this massive structure provided work for the period’s top architects and artists. After that, you can visit Holy Shrine of Shah-e-Cheragh. Shah-e-Cheragh is the most important place of pilgrimage within the city of Shiraz. The tombs became celebrated pilgrimage centres in the 14th century when Queen Tashi Khatun erected a mosque and theological school in the vicinity. Ahmad (Shah-e-Cheragh) came to Shiraz at the beginning of the third Islamic century (approximately 900 AD), and died there. During the rule of Atabeg Abū Sa’id Zangi (1130s AD) of the Zengid dynasty, the chief minister to the monarch by the name of Amir-Muqarrab-al-din Badr-al-din built the tomb chamber, the dome, as well as a colonnaded porch. Today we will visit the lovely garden tomb of Hafez, two of our most outstanding poets to feel the taste of Persian Literature. Hafez is one of great poets who impressed everyone with his mastery. His poems give us a special feeling and the peace in his tomb is really outstanding. Once the city’s main point of entry, Qur’an Gate stands majestically at the northeastern end of Shiraz. Initially constructed in the 10th century, the gate was restored several times over the centuries to the monumental sight you see today. At night we will visit there. Darius built the terrace, the Apadana (great audience hall), the Tachara (palace), the monumental staircases and his son, Xerxes, added the harem and the Hall of 100 Columns. Alexander the Great entered Persepolis in January 330 BC and then committed an uncharacteristic act of wanton destruction that still mystifies historians today, burning the mighty city to the ground. Though a shadow of its former self, the soaring pillars, terraces and sculptures of Persepolis still remain, but probably most impressive are the bas reliefs which line the site, telling the story of ancient governors and kings that came to Persepolis to pay tribute to the Persian Emperors. Then visit Pasargadae, UNESCO World Heritage Site, tomb of Cyrus the Great and former capital of the Achaemenid Empire. We will spend some time exploring the site and though not as striking as Persepolis, there is a great viewpoint where we can look over the site and the surrounding area. From here we will continue to Yazd, driving through a desert lined with mountains, often snow-capped. Today we start our day in Yazd. Yazd is one of Iran’s oldest continuously inhabited towns, its silhouette punctuated by minarets and the ingeniously-designed wind towers that capture desert breezes to cool homes during the hot summer months. Yazd is also the center of Iran’s Zoroastrian community, which is where you’ll begin the day’s sightseeing. In Amir Chakhmaq Square, you’ll see a very impressive Hussainia – a congregation hall for Shia commemoration ceremonies. With three tiers of recessed alcoves, all perfectly proportioned, its façade is one of the city’s most photographed landmarks. Then visit the Friday Mosque, built in 1324, where you can gaze upon the tallest minarets in the country. Isfahan has long been regarded as the focal point of any visit to Iran, ‘Isfahan is half the world’ was the phrase used to describe the city in the 16th century when Shah Abbas moved the capital here. It is still possible to see the Shah’s grand vision as we explore the city today. We will mainly be focusing on Imam square, one of the largest squares in the world which provides a breathtaking vista. The best view is found from the Ali Qapu Palace, where we admire the fountains and beautiful mosques that make up the square. We will enter the two mosques, first of all Sheikh Lotfollah, also known as the Ladies Mosque as it was built for the Shah’s harem, renowned for brightly colored domed ceiling, where the light creates the image of a peacock. We will then head to the Shah Mosque on the corner of the square, probably the best known mosque in Iran as it is thought to be the masterpiece of Persian architecture. Tonight there is the option to experience zurkhaneh, a traditional strength and wrestling event. Though visitors are allowed to enter for a fee, this is a part of Iranian culture where locals work out and wrestle whilst a leader bangs the drums, sings and reads poetry. This afternoon you have time to wander the rest of Isfahan, there is the main bazaar which is approximately 4km long, a great place for shopaholics and those enjoying bartering. The Iranians are much more relaxed than their Middle Eastern neighbors, so the markets are a peaceful experience, though there is always the chance to haggle for a bargain! You will continue your exploration of the city in some of the centuries-old, still elegant bridges that span the Zayandeh River. The 14th-century Shahrestan Bridge, for example, evokes the greatest aqueducts of ancient Rome and is the oldest bridge in Iran. Another famous bridges on the Zayandeh River are Sio-ce-pol and Khaju. There are sluice gates below the bridge to let the water runoff from Zayandeh River in the spring, and there are beautiful stony archways above each gate. These archways provide a great acoustic place for every man who wants to sing. You can always find a man or a group of men singing under the bridge. The songs are usually about betrayal or unrequited love. You have the chance to chat with these men and listen to their songs. Leaving Isfahan behind, your first stop this morning will be in Abyaneh village. Abyaneh Village is known as the Red Village because of its red soil and houses. The houses of Abyaneh bear an ancient architectural style, featured by the use of clay as the construction material and latticed windows and wooden doors. Then we will visit Kashan, a town originally famous for its textiles and ceramic production, but now better known for the Fin gardens and extensive bazaar and hamams. The Fin gardens are our first stop, a relaxing and visually impressive Persian garden with water channels all passing through a central pavilion, there is also the chance to buy some rose water, a local specialty – outside of the site. From here we will visit the bazaar area, a widespread complex filled with hamams and mosques; one hamam has been converted to a traditional tea house where we will stop for those who need a break from shopping. Walking through the bazaar we get to the Mosque of Mir Emad, which we will visit along with the Masjed-e Jame. Tonight we stay in a traditional house that has been converted to a hotel with a restaurant serving traditional Iranian food – many like to try the aubergine stew, if you have already eaten too many chicken kebabs! 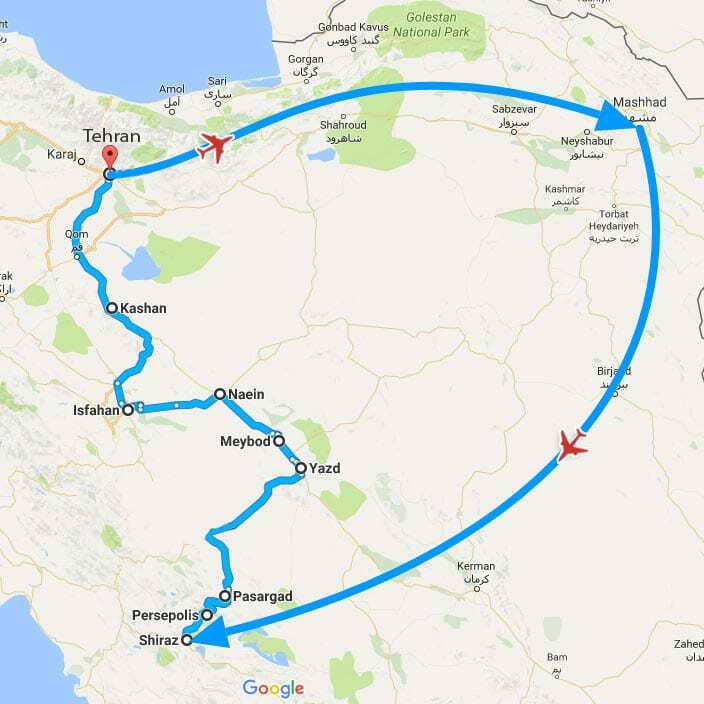 Then we will drive to Tehran. In the afternoon, you’ll go to see the National Museum of Iran which is an institution formed of two complexes, including the Museum of Ancient Iran and Islamic Era. Tonight’s dinner in a local restaurant offers a chance to experience daily Iranian life in Tehran. At night we go to Tehran Nature Bridge where Tehran young couples spend time together.